Murder, country-living and climate change anxiety are a few of the key factors of this great new podcast. Back in 2014 let’s just say that roughly 1 or 2 people out of 5 were hip to podcasts. That is not a scientific statement and as with our President*, the facts are my own, but you know, I feel pretty strongly about them. Before October of that year, the podcast landscape consisted largely of sports talk and comedian talk. There was some politics sprinkled in, as well as some pop culture shows, but podcasts hadn’t taken the leap yet though; they had yet to be considered a serious and viable form of entertainment. That changed with the release of Serial on October 3, 2014. Over the course of 12 episodes Sarah Koening and her team, vets from This American Life, dug deep into the murder of a Hae Min Lee, Baltimore teenager, and looked to uncover whether or not the teen’s ex-boyfriend Adnan Syed was rightfully convicted and sent to jail for the crime. Serial was the first podcast to generate the kind of water cooler-like excitement and conversation that was usually reserved for consensus television shows like Breaking Bad, Game of Thrones or Mad Men. All of sudden that questionable statistic I previously threw out there, the 1 or 2 people out of 5, was now closer to 4 people out of 5 who were listening to podcasts, specifically Serial. Serial‘s popularity led to a litany of think pieces, fame of sorts for Koening and even inspired a skit on Saturday Night Live. The podcast also opened the flood gates for intimidation, people looking to find their own intriguing story and create a true crime podcast of their own. The deluge was slow at first; it took about a year for the iTunes charts to start to become overrun with true crime podcasts. A few months later, if someone had died, there was a good chance that someone with a microphone and Garageband was looking to make a podcast about it. Yet the real break-through that Serial provided didn’t have anything to do with the content (entirely,) but had everything to do with the delivery of the content. Serial proved that an episodic form could translate to podcasts; that there was a market for it and an audience willing to come back week after week, provided the story was interesting and compelling enough. And it was that aspect that separated the pretenders from the contenders when it came to the podcasts following along in Serial’s wake. It was about the story telling more than the story. A good story certainly helped, but if you didn’t know how to tell it, then it didn’t matter. The second season of Serial wasn’t nearly as successful as the first, but I think that was due in large part to the lack of a true mystery, the inclusion of a controversial subject (Sgt. Bowe Bergdahl, who went AWOL, only to be captured by the Taliban,) and the amount of competition it faced in comparison to the first season. 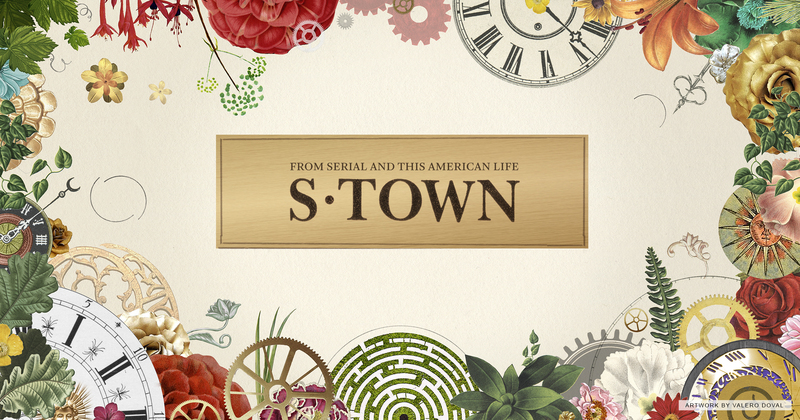 Now comes S-Town, essentially the first Serial spin-off. Instead of Koening leading the way, it’s Brian Reed, a This American Life producer, who, compelled by an email with the subject “John B McLemore lives in Shittown, Alabama,” spent years in Alabama, investigating this so-called Shittown, McLemore and whether a not a person was murdered and the murder was covered up by a local rich family. The show is less like Serial and more like Crimetown, a podcast that explores the criminal history of Providence, Rhode Island and has been one of my favorite podcasts since it debuted in late 2016. It’s atmospheric in that the main character is less of a person, but a town and as a result, the people and culture and history of the town. Early on, the podcast’s main character is McLemore, a middle-aged climate change enthusiast who lives on over a hundred acres of land with his mother and a bevy of antique clocks. Reed is smart; he lets McLemore talk and talk, discussing his belief that a dude was killed by the son of a local lumber magnate and the murder was subsequently covered up, even though the son has allegedly been heard bragging about it around town. McLemore is habitually disgusted – disgusted in the town, the people in the town, his inability to leave the town and of course, the sorry state of the world’s climate. But he’s more than just a bitter curmudgeon, something that becomes more and more apparent over the course of the second episode as we learn about his casual philanthropy and shepherding of a pair of brothers struggling to make ends meet and get their life on track. That first episode is a good house salad, but the meat and potatoes comes with the second episode, especially in the closing minutes. During a time where there is this definitive divide in our country, summed up most easily by who you voted for in the last Presidential election, it’s easy to go in thinking that the radio producer from New York City has traveled to rural Alabama to make light of their situation and make assumptions. This isn’t the case though. It’s far from it actually. Reed is genuinely interested here and also smart enough to not let his outsider status over shadow things, but also not ignore that status and assume everything is cool because of similar skin colors. If he ignored anything, it’s an obvious choice for a theme song. S-Town is pretty damn close though. S-Town was released in it’s entirety earlier this week. Previous: Previous post: Dispatch? Yeah, Dispatch.